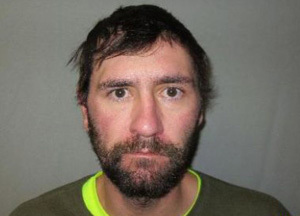 Christopher Nicholas Hiatt, 34, is charged with a rather novel form of assault in Montana: he licked the eyeball of an arresting officer. For that bizarre act, he is charged with felony assault on a peace officer and assault with a bodily fluid in addition to two other charges. Police were responding to a reported theft and encountered Hiatt who had an outstanding warrant from another county. He struggled with police when they sought to handcuff him and, as they pushed him into the back of a cruiser, he licked an officer’s eye. (2) A person convicted of the offense of assault with a bodily fluid shall be fined an amount not to exceed $1,000 or incarcerated in a county jail or a state prison for a term not to exceed 1 year, or both. (3) The youth court has jurisdiction of any violation of this section by a minor, unless the charge is filed in district court, in which case the district court has jurisdiction. (a) “Bodily fluid” means any bodily secretion, including but not limited to feces, urine, blood, and saliva. (b) “Emergency responder” means a licensed medical services provider, law enforcement officer, firefighter, volunteer firefighter or officer of a nonprofit volunteer fire company, emergency medical technician, emergency nurse, ambulance operator, provider of civil defense services, or any other person who in good faith renders emergency care or assistance at a crime scene or the scene of an emergency or accident. Under this law, any amount on spit or saliva contacting any part of the body of an officer can result in a criminal charge. This would also mean that if Hiatt kissed the hand of an officer, he could face the same charge under the law. Of course, licking an eyeball is just plain creepy. Darren, Because you only appear @ night. No aspersions but if any offense was taken I apologize. Your appearance during daylight destroys my assertion. Maybe he thought they were man mountain oysters…. Oh, and I think Darren is a vampire. Darren, What keeps most SMART hospitals proactive about nurse staffing is med mal lawsuits. I worked for attorneys that represented many hospitals in the Chicago and Madison area. A plaintiffs attorney is going to be looking @ staffing in any nurse malpractice. Now, I grant you not all hospital administrators are smart. But I have seen med mal lawsuits and the subsequent lawsuits get their minds right quickly. Hospitals insurance companies pressure administrators to have proper staffing. This is a positive outcome of med mal litigation. I think there is some misconception here about what is going on with Nurses and patient ratios. Nurses in clinics might have many patients in that a person comes in, is seen and then leaves. Nurses in hospital environments are in a different situation. It is not a bravery or toughness issue with how many patients nurses can handle. There are factors such as cost, safety, and worker burnout. Many hospitals will try to assign more patients per nurse to save costs but if this becomes excessive it puts a strain on employees. It is like any other occupation or profession, a person can only have so much workload before something breaks down. Unions can be good or bad depending on many factors, but overtaxing workers is one of the reasons unions come to popularity with employees. Consider this situation. If a hospital short sightedly declared that all nurses must add one extra patient to their responsibility it might not be an issue with a nurse at a walk in clinic but to a critical care nurse who has two very sick patients the addition of one more would amount to a 50% increase in workload. In that situation it could be hazardous to the welfare of of all his / her patients. Tired employees of any kind are likely to make errors or omissions when they are stressed or worn out. An employee who picks apples, a mistake is often not a big deal. But, in a hospital environment a mistake can injure a patient. That is why it is important to be holistic about nurse / patient ratios. It is not as easy as it might seem. I know there have been many cases reported about officers using the Resisting Arrest charge indiscriminently and those are definately so. But in many areas, like where I worked, judges don’t buy the notion of someone squirming around, or being difficult upon arrest. There has to be more than that, generally being assaultive and requiring a lot of work to hook them up before our judges would buy into it. Darren – here they add Resisting to almost every arrest. However, I think the dashcams are helping there. It was a way to pile on charges so that the arrestee would plea out rather than go to trial. We will drop the Resisting and x if you plead guilty to y. That was the usual scenario. How the heck does the offender get close enough to lick an eyeball while they put the handcuffed offender into the cruiser?? Annie – an article on the effect of unionized nursing on both nurses and patients. RNs and their UNIONS have been instrumental in getting safe nurse/ patient ratios. Perhaps Spinelli, you should know what you are talking about before making generalizations about RNs. Annie – safe nurse/patient ratios are an artificial construct. BTW, I wondered who was ‘snitching’ on Nick. Thanks for outing yourself. I am absolutely against teachers unions and unions in so-call professions, like nursing. Unions protect their members. Teacher unions protect teachers, they do nothing to protect students. And I think you would be hard pressed to prove the nurses union was designed for patient care. Such utter baloney, Spinelli. Do you have something you want to say or do I have to email Professor Turley once again regarding you? Nurse Jackie don’t need no stinkin’ union. The tough RN’s I know just want to do their best work and not have to work w/ lazy union workers. Good RN’s look upon themselves as professionals. A union is antithetical to being a professional. RN’s, PA’s, etc. don’t want or need the weight of a union pulling them down. I know many and have interviewed many more on med mal cases. Now, maybe the people don’t the ladder, NA’s, LPN’s, etc. would want to be in a union. They have less education, credentials, and clout so a union might be worthwhile to them, providing they have righteous union leaders. That’s always the problem, the union being more about the executives than the workers.